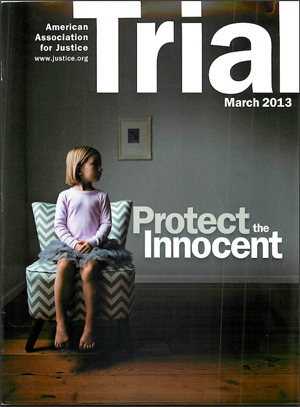 Kevin Goldberg wrote an Article Published in the March 2013 edition of Trial Magazine titled "Dangerous Drinks." This Article discusses the dangers of energy drinks, and summarizes some of the peer reviewed scientific/medical studies indicating that energy drinks are dangerous for anyone with an underlying heart condition. 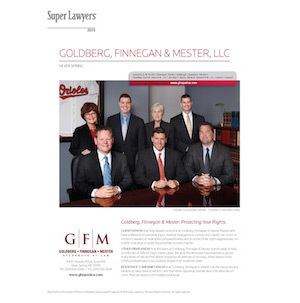 Kevin Goldberg, Kevin Finnegan, and Jean Jones were selected by their peers as 2013 Maryland Super Lawyers. 2011 Excess Verdict in Prince George's County! $175,000.00 verdict in Circuit Court for Prince George's County for a girl who broke her arm when she was hit by a car while crossing the street in the crosswalk. This verdict was in excess of the defendant driver's $100,000.00 insurance State Farm Insurance policy. State Farm's lawyer disputed liability, arguing that their driver was not at fault and that our client, although a minor child, was contributory negligent and barred from recovery. State Farm chose not to make a settlement offer in this case, which forced the case to trial and exposed its insured driver to an excess verdict. Although the defendant driver only had $100,000.00 in liability insurance, the insurance company ultimately ended up paying more than its insured's policy limits since it made the wrong decision in forcing this case to trial. This is Goldberg Finnegan's second verdict in excess of a State Farm insured's policy limits in the past 12 months. Kevin Goldberg was the 2009-2010 President of the Maryland Association for Justice (formerly the Maryland Trial Lawyer's Association). 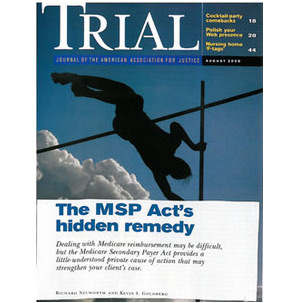 Trial Magazine Article written by Kevin Goldberg and Richard Neuworth about private causes of action under the Medicare Secondary Payer Act. Kevin J. Finnegan was selected for "Maryland Super Lawyers 2009"
Kevin I. Goldberg is the President of the Maryland Association for Justice (formerly Maryland Trial Lawyer's Association). Kevin Finnegan wrote an Article titled Maximizing Your Medical Expenses Claim In Your Auto Negligence Case. Spring 2009: Justin Katz and Mark Schofield wrote an Article about personal injury lawsuits in the District Courts of Maryland titles "Tips For new Lawyers Planning To File Lawsuits IN the District Court Of Maryland." the Article was published in the Spring 2009 Maryland State Bar Association Young Lawyer Section Newsletter. November 2008: Kevin J. Finnegan wrote an in-depth article discussing a practical way to prosecute the plaintiff's premise for a liability case. The article is written as a guide to help prosecute a plaintiff's premise for a liability case. The Maryland Trial Lawyer's Association's Summer 2008 Edition of Trial Reporter Magazine published two articles written by attorneys at our firm. The Maryland Daily Record published an Article by Kevin I. Goldberg on unsafe toys. On the second issue presented relating to the verdict in the amount of almost $1 million dollars for the husband's loss of consortium claim, the appellate court stated the injuries to Mrs. Ford were well documented in the testimony, and it would have required little imagination for the jury to evaluate the effect of that condition upon her relations with her husband. 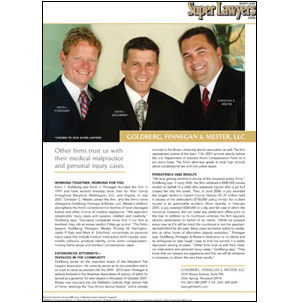 Kevin I. Goldberg was featured in Maryland Super Lawyers 2007 Magazine and in Washington D.C. Super Lawyers 2007 Magazine where he was selected as among the top 5% of practicing attorneys in a peer review and evaluation process conducted by Law & Politics. A photo of the Law Firm and an Article about the firm appeared in Maryland Super Lawyers 2007 Magazine. Kevin Goldberg was selected by his peers for inclusion in Maryland Super Lawyers and Washington, D.C. Super Lawyers in 2007 and 2008. Kevin Finnegan was selected by his peers for inclusion in Maryland Super Lawyers and Washington, D.C. Super Lawyers in 2008. Kevin Goldberg received a preeminent 5.0/5.0 AV Peer Review Rating from Martindale Hubbell on April 20, 2011 in Automobile Negligence, Bodily Injury and Medical Malpractice.